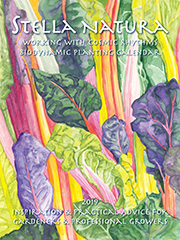 Stella Natura 2019 Biodynamic Planting Calendar and Planting Guide – What is Biodynamic Agriculture? What do you think a human being really is? Your answer to this question will determine the character of your actions towards other people. If you conceive of yourself and all humans as wisely fashioned divine creations with a capacity for love which can only be achieved through one's own activity, you will be more likely to take an interest in other people and their development. If you see humanity as an accidental product of physical processes occurring randomly in the universe, it may be more difficult to find the motivation for earnest and consistent work on yourself and for others. The same holds true for your concept of nature. Ours is not a philosophically oriented culture, yet we are strongly influenced by the unspoken philosophy of materialism that prevails in our education. Thus we are led to accept actions towards the earth that are the consequences of a mechanistic view of living creatures and their mutual relations. Biodynamic agriculture springs from a spiritual world view known as Anthroposophy. The Austrian philosopher and seer Rudolf Steiner developed a new approach to science which integrates precise observation of natural phenomena, clear thinking, and knowledge of the spirit. It offers an account of the spiritual evolution of the Earth as a living being, and of the constitution of the human being and the kingdoms of nature. Rudolf Steiner gave a series of lectures in 1924 in response to questions brought by farmers who noticed even then a deterioration in seed quality and animal fertility. Practitioners and experimenters over the last seventy years have added tremendously to the body of knowledge known as Biodynamics. It is a constant source of awe and inspiration for even the most experienced farmers and gardeners to discover not only that the indications which Steiner gave in his Agriculture Course are still helpful but that one can always come to deeper levels of understanding them. In a very real way, then, Biodynamics is an ongoing path of knowledge rather than an assemblage of methods and techniques. Does one have to study other works by Rudolf Steiner to understand Biodynamics? This has been answered differently by different people, and biodynamic literature ranges from the "how-to" approach to more thoughtful in-depth study material. Yet even at a basic introductory level you will be confronted with the fact that the spirit in nature is not treated as a vague, poetic reference but as a reality which can be treated scientifically. Life forces are present in substance – or not. For instance, soil can be alive or dead. One can begin to develop a faculty to perceive the quality and presence of life. In an extreme example one could compare a fruit freshly picked from the tree with a fruit which has been irradiated, and whose seeds can never germinate. The substance remains the same but the life-forces are absent. Which one will be more nourishing to eat? Animals, of course, are more complex than plants, having an internalized consciousness. What difference does it make if a chicken, a cow, or a pig is allowed to move freely and use all its senses to experience nature and seek its food? If your only criterion for measuring food value is quantitative, there is no difference. Biodynamics focuses on the quality of the food. It recognizes a direct connection between the quality of food and not only human health but also human consciousness. Just as we need to look at the magnetic field of the whole earth to comprehend a compass, in order to understand plant life we must expand the scope of our thoughts to include the whole universe. No narrow microscopic view will suffice. Plants are utterly open to and formed by influences from the depths of the earth to the heights of the heavens. Therefore our considerations in biodynamic agriculture range much more broadly than is generally assumed to be relevant. The light of the sun, moon, planets, and stars reaches the plants in regular rhythms. Each one contributes to the life, growth, and form of the plants. By understanding the gesture and effect of each particular rhythm, we can time our sowing, cultivating, and harvesting to the advantage of the crops we are raising. For example, the few days preceding the full moon are most stimulating for the germination of seeds. Plants grown from seeds sown on days of Perigee (when the moon comes closest to the earth in its elliptical monthly orbit) or of Eclipses, will tend to be weak and vulnerable to fungus and pest attack. It has even been found that the moon acts as a kind of gate as it passes in front of the twelve constellations of the zodiac, opening the way for specific influences which strengthen either the root, leaf, flower or fruit of plants which are sown and cultivated then. The most notable research in this field has been done for decades by a German farmer named Maria Thun, who publishes an agricultural calendar. In America, the Stella Natura calendar makes these rhythms available, with practical advice for gardeners and farmers. A balanced soil that is rich in humus, worked through by earthworms, and teeming with lively activity is far more than the physical anchor for roots and an absorbent medium for liquid nutrients, to which soil is reduced in conventional agriculture. (In greenhouse hydroponics, where plants are grown only in "fertilized" water, soil is done away with altogether!) Biodynamics recognizes that soil itself can be alive, and that this vitality of the earth supports the life of the plants that grow in it. There is no distinct boundary between the life of the plant roots and the life of the soil that surrounds it. Therefore, our fundamental effort is to build up stable humus in our soil. We do this through correct composting methods, as well as through other techniques such as crop rotation, green manuring, and cultivation. Rudolf Steiner pointed out that plants themselves cannot be ill – we can always find the cause for their pathology in their environment. For this reason, the way to have healthy crops is through compost and care of the soil. Chemical agriculture feeds crops by adding soluble minerals to the soil. The plants take these up via water. Their natural ability to seek from the soil what they need for balanced growth is bypassed. The result is deadened soil, no earthworms, unnatural boosting of growth, and weak plants. Even more serious than the toxicity of pesticides, herbicides, and chemical fertilizers, is the insidious separation which has been effected between plants and the earth. By short-cutting the roots' normal activity of dissolving the minerals that are present within the solid ground, we have cut them off from their home. Plants that are forced to grow in such ground are like motherless children, and it is no wonder that through their weakness they are prone to disease and pest damage, opening the way for even more deadly poisons in the field. Human beings need to eat food which has been grown with a strong connection to the earth. Without this we lose our own grounding and orientation. Many of the symptoms that we suffer in our culture today are the result of people having eaten for decades food which no longer properly bears the connection to the earth. When Rudolf Steiner spoke about animal nutrition he said that the cows fed wrongly will not show the results, but succeeding generations will not have healthy instincts. It appears that this is not only true of animal nutrition. The rehabilitation of society must be based on a new revolution in the field of agriculture which is not based on quantity but on quality. Rudolf Steiner posed the ideal of the self-contained farm: there should be just the right number and combination of animals to provide manure for fertility, and these animals in turn should be fed from crops grown on that farm. In current agricultural practice the opposite takes place: animal feed is brought in; fertilizer is imported; and manure is often considered a problem. As we know, the mixed farm is nearly extinct in America. (Farmers are so rare that they have been taken off the census as a vocation.) The various aspects of agriculture – animal husbandry, grain growing, vegetable and fruit culture – have been dismembered for the sake of mechanization, "efficiency," and centralized profit. The challenge to build up a diversified, self-contained farm can inspire the farmer to observe the wise and subtle relations in nature and to work with them creatively. What has been lost is the built-in educational opportunity to balance the various aspects of nature in a harmonious and healthy organism. Many human beings who now suffer from either unemployment or unsatisfying jobs could find meaningful and wholesome work on such farms. Yet present economic conditions are such that this seems an impossible ideal for most people to strive for. Is the biodynamic ideal of self-contained farms accessible only to isolated homesteaders or wealthy gentleman farmers? Within the biodynamic movement various social forms have been explored to create such farms. Communities that have a nonagricultural task, as for example the Camphill Community to which I belong (which is committed to life-sharing with people who have developmental disabilities), embraces a large mixed farm as an integral part of its life and work. In other circumstances, several small agricultural ventures in a locale join together to create one farm organism, sharing resources. The essential element that should not be lost is the preservation and recycling of the resources with which we are working. Vegetable waste, manure, leaves, and food scraps all contain precious vitality that can be held and put to use for building up the soil if they are handled wisely. Or, that potential can be squandered and dispersed through poor management. Thus, composting is the key to biodynamic farming, and this activity is available even on a scale of backyard gardening. No matter how carefully resources are husbanded, through the very fact of removing crops from the land the earth is depleted. Is there a source from which to draw new life-forces into nature? All life on earth is dependent upon the tremendous energy of the sun. All the planets in our solar system are actively influencing plant and animal life as well, each with a particular gift or quality. This has been known by older cultures, which identified certain plants and bodily organs with each planet. Rudolf Steiner pointed out that a new science of such cosmic influences would have to replace the old instinctive wisdom and traditions. Out of his own insight he introduced what are known as the Biodynamic Preparations. Made from chamomile, yarrow, dandelion, oak bark, valerian and stinging nettle, they bring together particular elements from nature at certain seasons of the year. The forces which they bear are concentrated, and are then able to be used to focus the chaotic elements within the compost piles, inwardly "organizing" them. Two of the Preparations are used directly in the field, one on the earth before planting to stimulate soil life, and one on the leaves of growing crops to enhance their capacity to receive the light. In these Preparations we have medicine for the Earth which draws in new life forces from the cosmos. Everything in nature reveals something of its essential character in its form and gesture. Silica is opposite to limestone, for example, in its relation to water and in the way it supports plant growth. There is a similar polarity between those plants that swell out and provide substantial nourishment for animals and people, and those plants (often called weeds) that go quickly to seed, focusing rather on reproducing themselves. Among animals there are those, like the cow, in which the metabolic functions predominate. And there are others, like the sensitive deer, in which the nerve-sense activities come more to the fore. These are just a few "letters of the alphabet." Careful observation of nature – in shade and full sun, in wet and dry areas, on different soil, will yield a more fluid grasp of the elements. So eventually one learns to "read" the language of nature. And then one can be creative through specific techniques to bring new emphasis and balance to the land for which one is responsible, which often tends to be one-sided in some way. Rudolf Steiner emphasized the absurdity of agricultural economics being determined by people who have never actually raised crops or managed a farm. We know how disastrous the effects have been when this is the case. Farmers are forced to adopt measures for purely economic reasons which their own judgment cannot support. A new approach to this situation requires the association of producers and consumers for their mutual benefit. One such way, born in the biodynamic movement and spreading rapidly, is Community Supported Agriculture (CSA). Gardens or farms gather 'round them a circle of supporters who agree in advance to meet the financial needs of the enterprise and of its workers. These supporters each receive a share of the produce as the growing season progresses. The income of the land workers is thus guaranteed, and the budget is determined according to insight rather than financial pressure. The consumers become conscious of the real needs of the farm; they rejoice in the rich harvests; and they remain faithful under adverse circumstances. Given the demand for cheap food and the general lack of awareness of agricultural practices, a tremendous education of the public will be needed to reverse the current trends. No matter where our land is located, if we are observant we will see sure signs of illness in trees, in our cultivated plants, in the water, even in the weather. Organic agriculture rightly wants to halt the devastation of nature caused by humanity. Rudolf Steiner clearly advised that all practices remain within the realm of the living. Thus the biodynamic movement, founded in 1924, is in fact the oldest advocate for "organic" agriculture since the idea of chemical fertilizer was introduced. It goes on to offer ways of healing the living earth through human insight into the formative forces of the cosmos. Once again we come to the fundamental questions of our existence. To truly understand Biodynamics, these questions about our origin and our relation to nature need to live in us. However, the earth itself and all those who eat the produce can benefit directly from the health-giving results of the biodynamic methods. While there is no question that the Agriculture Course is the basis of Biodynamics, it is not advisable to turn to it as a beginner. The Course was given in the last year of Rudolf Steiner's life to invited students of Anthroposophy. It presumes familiarity with anthroposophical concepts and terms. For this reason it is suggested that one begin with other books that have the express aim of introducing the basic concepts.